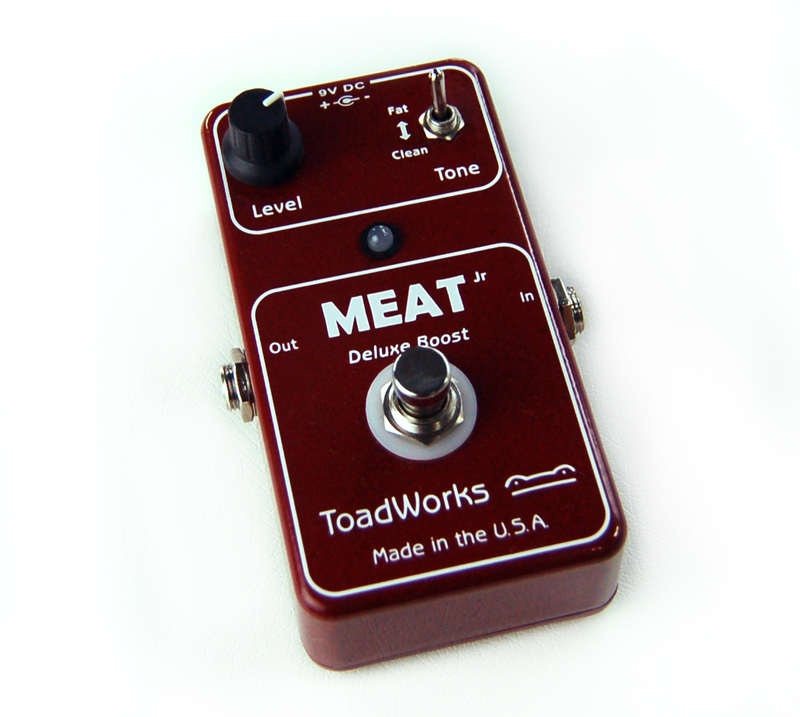 ToadWorks MEAT Jr is a compact Deluxe Boost, designed for maximum versatility at the lowest cost. Like the original MEAT pedal, MEAT Jr has been tested with a wide range of guitars and amplifiers; low output or high, solid state or tube, MEAT Jr provides all the beefy goodness your rig needs. The fat is phat, and the clean is pristine. In Clean mode, MEAT Jr is the perfect linear boost, putting out exactly what was put in, without the slightest change to your tone. ToadWorks MEAT Jr is a quick and easy approach to fat and clean tones. With MEAT Jr, you get all the fat, with none of the weight. MEAT Jr represents the very best in Deluxe Boost design. 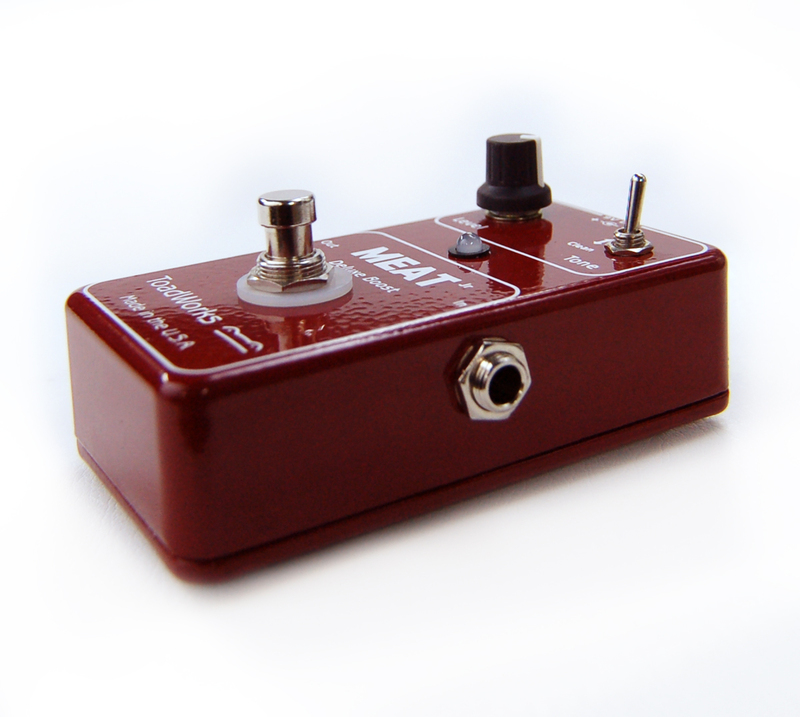 With it's low power consumption, ease of use, and superior tone, MEAT Jr. leaves every other Deluxe Boost in the dust. 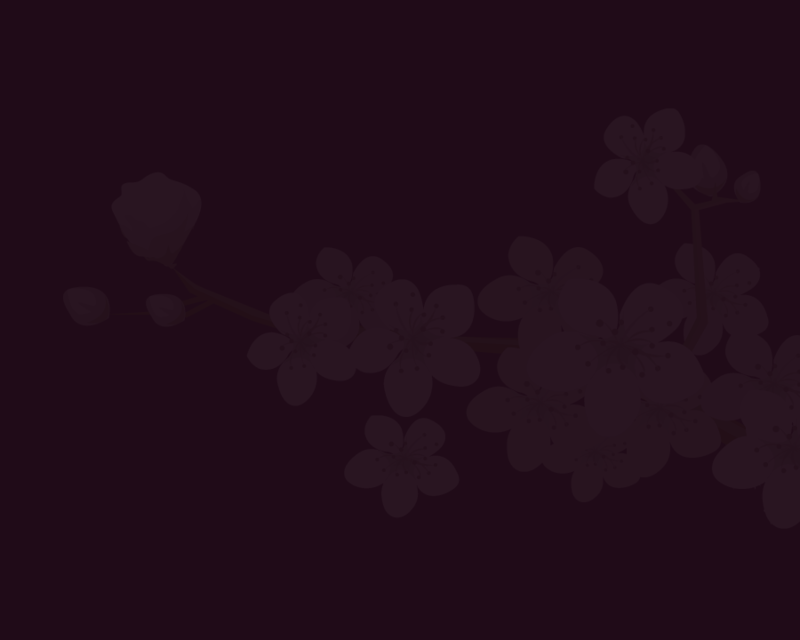 Priced to fit any budget, MEAT Jr. is the choice of pros and amateurs alike. The mini-toggle switch provides quick change from clean to mean, fattening up your signal with a flick of the finger. MEAT Jr is hand wired, by people, not machines. From our high quality 3PDT switches to the custom made enclosures and knobs, each component is the finest available, making ToadWorks Pedals the most well-built and reliable effect pedals in the world. ToadWorks MEAT Jr is a Deluxe Boost effect designed to provide a fat, warm boost, or a crisp, clean boost. Like the original MEAT pedal, MEAT Jr is perfect for simple solo boost, fattening up your tone while maintaining unity gain, or overdriving your amp input so hard it bleeds. 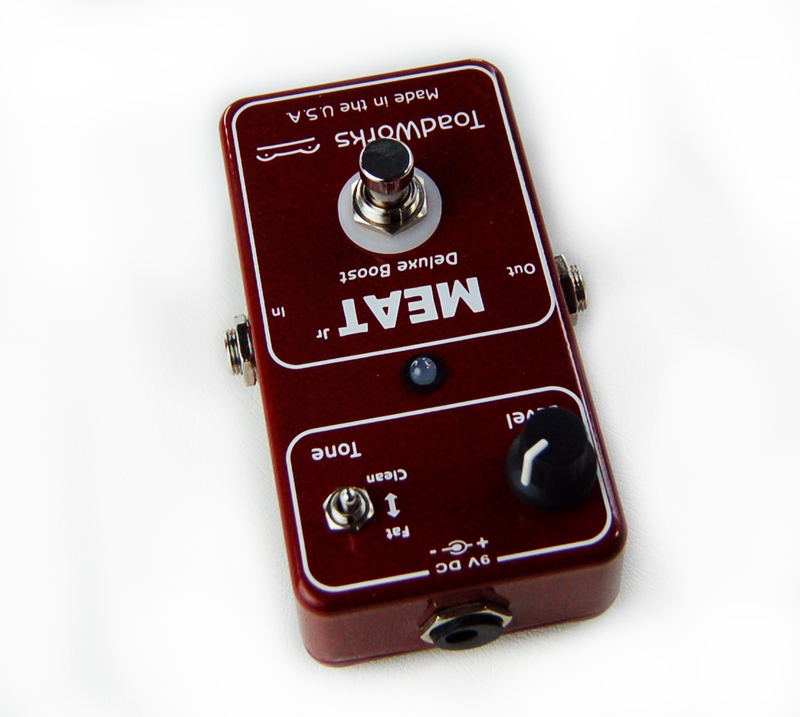 MEAT Jr is the perfect linear boost, featuring ultra-low noise and the perfect amount of switchable low end. 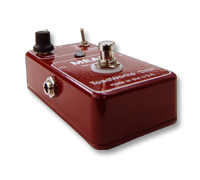 The stomp switch turns the effect on and off, the Tone switch enables the Deluxe Boost, and the Level knob controls the overall boost level. MEAT Jr features a true-bypass circuit, so you can cut out the fat without sacrificing tone. Each pedal is carefully manufactured by hand, using only the finest components.